Since we shop online regularly at several different stores for Well Registered, we can't help but notice when there are comparable products at different stores. So today we're featuring a high-low product comparison for one of our favorite art prints. 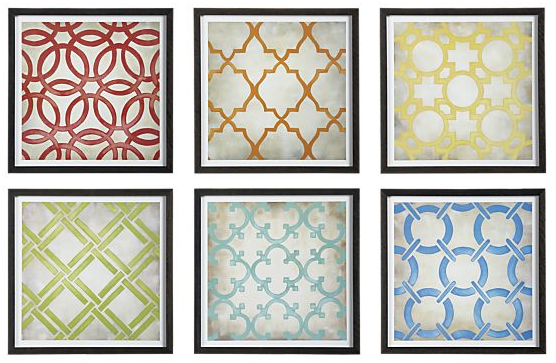 Crate and Barrel has offered these framed geometric prints for a while now, and they have always been one of our favorites for home decor. They're currently selling for $369.00 for the set of six prints, or for $69.95 each. 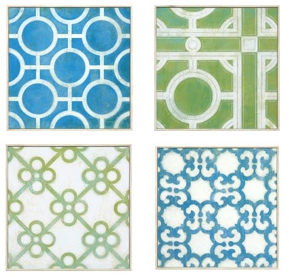 Now, take a look at some new geometric prints that Target is offering. 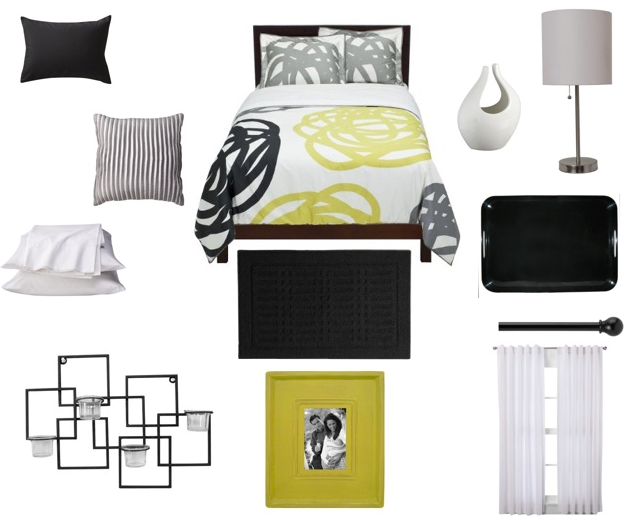 You could also try to make similar prints yourself to frame for your wall decor. 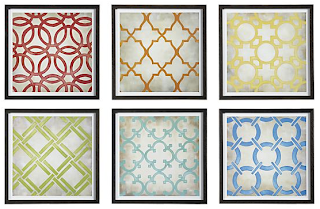 Check out this link for an example of how to go about making these Crate and Barrel geometric prints yourself. How should I get the word out about my wedding registry? You've worked hard to set up a wedding registry that is perfectly suited to your style and needs. Now, you need to know what to do (and what not to do) to get the word out. 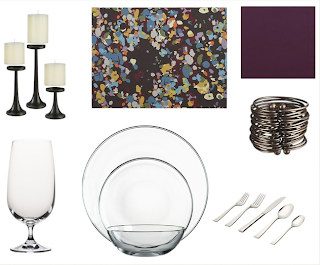 The best way to let your guests know about your wedding registry is by word of mouth. Make sure that your parents and members of your wedding party know which stores you are using for your wedding registry. Many guests will talk to your close friends and family to learn the details about your registry. Most couples now set up a wedding website to give guests details about their wedding events, their story, and their wedding party. It is common and acceptable for the wedding website to include information (and even links to) your wedding registry. You can tell guests about your website through word of mouth, or by including a link to the site on your save-the-date cards or any informal information you send about wedding details. Make sure the person(s) hosting any bridal showers for you know the details of your wedding registry. Invitations for showers often let guests know at which stores you are registered. There are couple things you should not do when getting the word out about your registry. As the engaged couple, you should not mention anything about your wedding registry to your guests unless specifically asked. This includes communication on Facebook, Twitter, and other social media sites. You don't want to come across as greedy or rude, so avoid talking about the specifics of your wedding registry unless asked directly. Traditionally, it has been considered taboo to include registry information in your wedding invitations. We absolutely think it's best to stick with this traditional etiquette. However, many stores and stationary companies are now providing registry cards to accompany your wedding invitations. Some wedding experts support this new trend, but we encourage you to say “no thank you” to these registry cards. There are plenty of other ways to get the word out about your registry. Stick to tradition and use word of mouth, shower invitations, and wedding websites to let your guests know about your well-planned wedding registry. 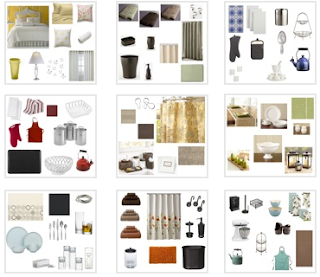 So far we've doubled the number of inspiration boards for both Target and Williams-Sonoma. 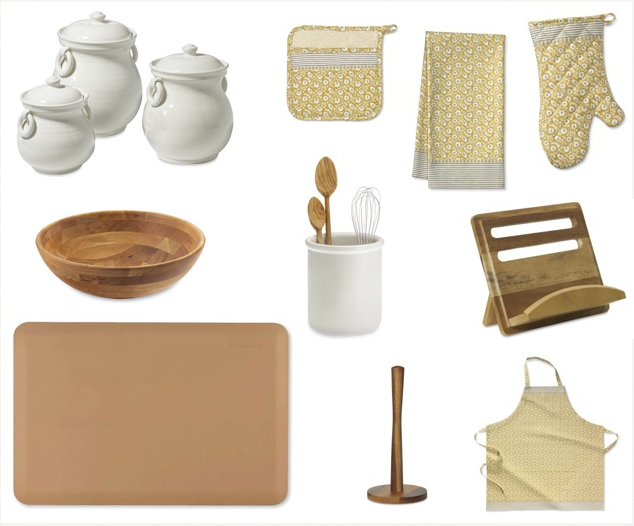 Check out the Inspiration Board Homepage for Target and the Inspiration Board Homepage for Williams-Sonoma, or just take a peek at some of our favorite new inspirations. Check out Well Registered for more inspiration! Call us old-fashioned, but we highly recommend sending a handwritten thank you note to each guest who gives you a wedding gift. Thank you notes are still considered proper (and expected!) even in our technology-loving culture. Each Thursday we will feature our favorite stationary available for you to purchase on the internet and also some do-it-yourself ideas to make your own. Before your wedding, make a banner that says "thank you" out of fabric or paper. On your wedding day, hold the banner with your spouse for a quick photo and use the picture to make a photo thank you card. Make sure your wedding photographer could get the photo to you quickly after the wedding. If not, have a friend take the picture so you can get your thank you cards printed, written, and mailed to your guests quickly. These thank you notes from Target are inexpensive and classic. They are available online and in stores. 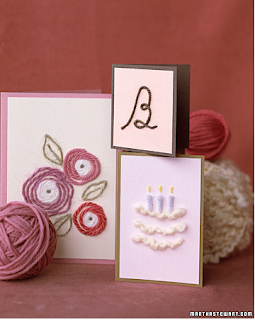 You could easily make your own thank you cards, like these shown from Martha Stewart Weddings, using card stock and yarn. Draw your monogram or a shape using glue onto your card and attach yarn in your wedding colors to make inexpensive thank you cards with homemade charm. No matter how you do it, make sure to say thank you! While Well Registered focuses on wedding registries, each week we will feature some of our favorite wedding day inspirations and tutorials. This week we're inspired by Do It Yourself projects made from paper. Using paper is so versatile since you can use any color you'd like, and it is also an inexpensive way to add some decor and whimsy to your wedding. 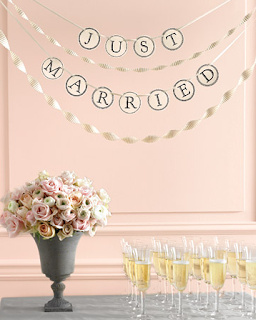 Martha Stewart Weddings offers a free template for this paper banner. You could print any words you would like for a custom wedding banner. 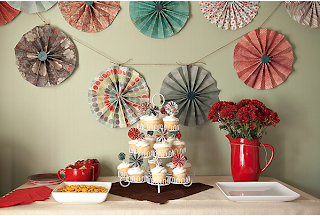 The Bride's Cafe has a great tutorial on how to make these adorable pinwheels out of scrapbook paper. 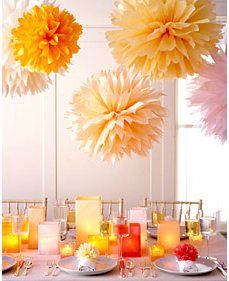 Martha Stewart Weddings has a tutorial on how to make these pom poms from tissue paper. They would be easy, inexpensive, and you could make them in any colors you like. 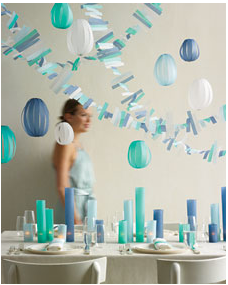 Here's another DIY paper craft you could do for wedding decor from Martha Stewart. The tutorial shows you how to make paper garlands and hanging lanterns using vellum paper. Most wedding experts agree that the best time to set up your wedding registry is 3 to 6 months before your wedding day. This allows plenty of time for your guests to purchase their gifts but not enough time for all your items to go out of stock before your big day. If you are having a shower thrown within those 3 to 6 months, you should try to have your registry set up and ready to go about 1 month before the first shower. Otherwise, you should aim to set up your registry within 3 to 4 months before your wedding day. Many department stores suggest that couples set up their registry within several weeks of announcing their engagement. This supposedly allows friends and family to purchase gifts off your registry for engagement parties or just a congratulatory present. If there is no history of your family or friends giving engagement gifts, we would opt to wait until later on in your engagement to set up your wedding registry. Since engagement gifts are not customary, it's almost always best to not seem like you expect gifts at that time. You may even choose to include a “no gifts please” message in any invitations sent for an engagement party. Only register for a small selection of items. Try to make this "starter" registry very basic. Now is not the time to coordinate your table linens and throw pillows. 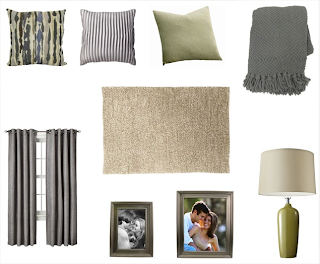 Add items that will not limit your style down the road. Kitchen electrics, wineglasses, barware, aprons, and welcome mats are common engagement gifts that could be great options for an early wedding registry. The appropriate time frame for setting up your wedding registry is wide but tricky. Too early and you may fall in love with some items that end up being out of stock. Too late and you may seem careless. Make sure to register 3 to 6 months before your wedding day and you'll be just fine. How Many Items Should I Add to My Wedding Registry? We believe that you should also have nothing on your registry that you do not know to be useful or that you believe to be beautiful. If you both hate coffee, you probably shouldn't register for a fancy coffee maker. If you know you won't use crystal serving pieces, there is no place for them on your registry. No matter how traditional an item may be for a wedding gift, if you don't love it or know it will be useful you do not need to bring it into your home. With that said, there are some guidelines as to how many items you should put on your wedding registry. First you will want to make sure you know how many guests are expected to attend your wedding. Many stores and wedding experts suggest that you should register for two to three items for each guest you are expecting. We suggest, if you are wanting to register with your goal in mind, that you should register for one item for each guest to begin with. For example, if you are expecting 100 guests at your wedding you should add about 100 items to your registry. Take time to think about the purpose behind your registry and decide what items you want to receive the most. 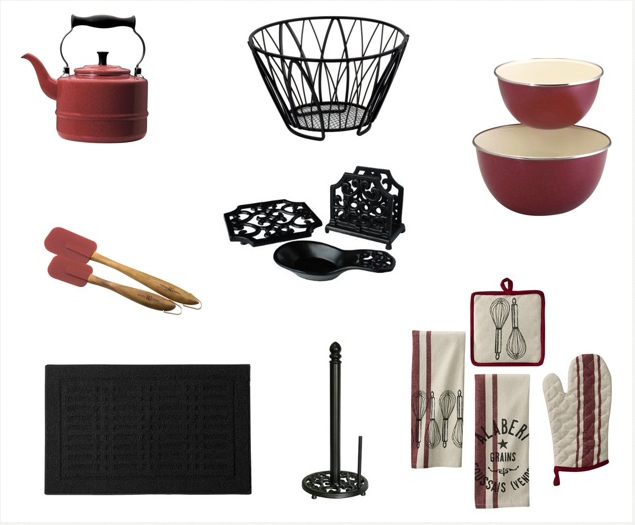 Put your most-wanted items on your registry first. Then as gifts get purchased, add more items to your registry. 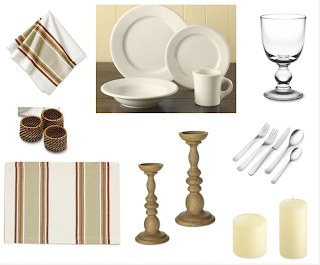 Most guests appreciate having a wide selection of gifts to choose from when purchasing off wedding registries. If you know that you won't have time to keep an eye on your registry, you should try to add more items initially. In this situation, we recommend registering for two items per guest. No matter how many items you end up putting on your wedding registry, always remember to have a wide selection of prices for your guests to choose from. And don't forget to make sure you know all the items will be either useful or beautiful to you. For every wedding gift received, there should be an honest and heartfelt thank you note sent. Even though wedding registries have become more modernized, an old-fashioned hand-written "thank you" is an essential part of your wedding registry. Each Thursday we will feature our favorite stationary available for you to purchase and also some do-it-yourself ideas to make your own. 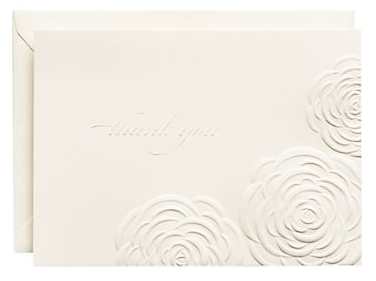 These gorgeous, rose embossed thank you cards are available at Paper-Source.com. 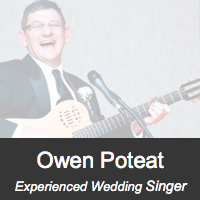 They are classic and can be a great choice regardless of the style of your wedding. They are currently being sold for $16.00 for a set of 10 cards and envelopes. These thank you cards are an affordable option and they are easily available at both Target stores and Target.com. They are currently being sold for $12.99 for a set of 50 cards and envelopes. 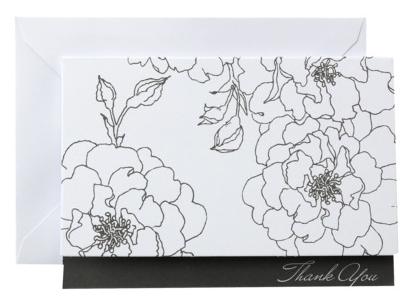 You can easily and inexpensively make your own thank you cards with card stock and rubber stamps. 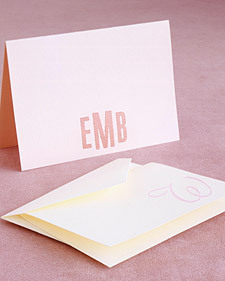 The stamped monogram shown in the example above is a traditional option that would be simple to make. No matter what you use, make sure to say thank you! Since today is the launch of WellRegistered.com, we thought we'd share all the ways you can get connected from the start. 1 - You can follow the blog. Follow the blog to get updates on the newest material added to the website and other information about weddings and registries. On the right sidebar you can sign up under "Google Friend Connect." 2 - You can Like Well Registered on Facebook. Like us on Facebook to get more updates and get connected with others planning their wedding registry. 3 - You can follow Well Registered on Twitter. Follow us on Twitter to get even more updates and connect with more people. 4 - You can follow Well Registered on Pinterest. You can follow us on Pinterest to see our favorite products. If you see a product you would like to see featured on an inspiration board, @mention Well Registered and we'll make it happen. Leave a comment below if you need an invitation to Pinterest. We hope that you can get connected to Well Registered and enjoy the process of planning your home. The first and most important step toward becoming well registered is to ask yourself, “What is the purpose of my wedding registry?” There are many different approaches you can take with your registry. 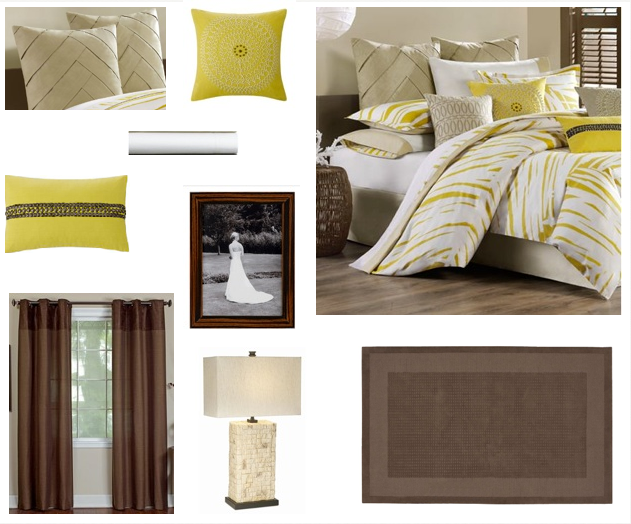 Our biggest advice regarding wedding registries is to decide what approach you wish to take. 1 – We want to get all the basics needed to start our home together. This is a great goal to have for your registry if you are just starting out and don't have a lot of household items already. Think about your current situation – what you need and want to start your married life together. Also discuss what you don't need or want and choose to resist any pressure that may come to register for those things you don't desire. 2 – We want to get nice items that will last a long time. This is a good approach to take if you will be able to afford to purchase the things you need that you don't receive as gifts. 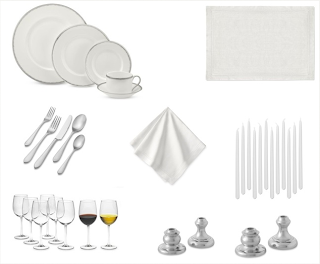 Crystal, fine china, silverware, luxury linens and high-end kitchenwares are very popular among wedding registries and many of these items can last a lifetime. Think about not only what you want and need in your current situation, but also things you may want many years into the future. Try to read reviews on your expensive products to ensure that you are receiving items that really will last a long time. 3 – We want to upgrade items that we already own. This approach is great to take if you already have a lot of the household items you need but still want to have a traditional registry. Take time to go through your home and make a list of things you wish to upgrade. Splurge on upgrading items you use often and fill any gaps you may have in your home. Don't hesitate to register for items like furniture or home décor. 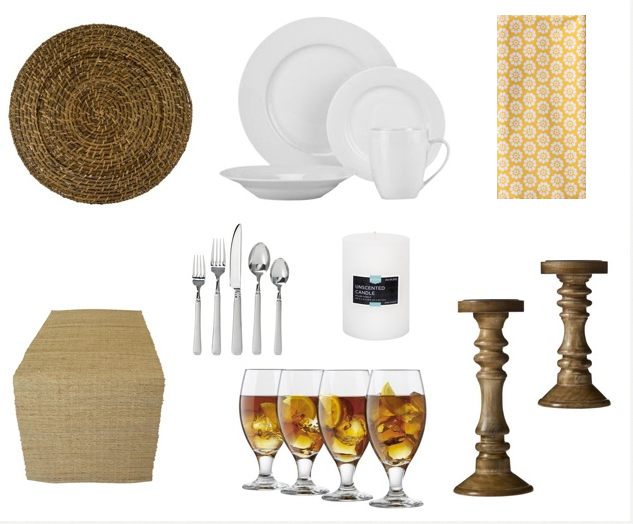 4 – We want to have a non-traditional wedding registry. This approach to the wedding registry is a good option if you have all the household items you want or need, or if you simply don't want to do the traditional registry. Non-traditional wedding registries are growing in popularity and there are many options available to you. You can register for your honeymoon. Sites like www.honeyfund.com and www.thehoneymoon.com allow you to choose different parts of your honeymoon (airfare, excursions, meals, etc) that guests can contribute towards. You can register at non-traditional stores for different hobbies you enjoy. Did you just buy a house you plan to renovate together? Register at stores like Home Depot for tools and supplies. Do you and your spouse love to be outdoors? Register at stores like www.REI.com for camping and hiking gear. Are you wine lovers? There are websites like www.BottleNotes.com that offer wine registries. Think outside the box and register for things you truly love. You can make a registry to help fund non-profit organizations. Check out sites like www.IDoFoundation.org and www.ChangethePresent.com that allow you to choose non-profit organizations to have your guests make donations toward in your honor. You can choose not to have a wedding registry. While we obviously love registries, we realize that they are not for everyone. Stand strong in your decision, but be prepared to receive more faux diamond and pearl embellished picture frames than you know what to do with. Even if you do no other research before completing your wedding registry, if you honestly assess the purpose behind your registry you will likely be happier with the end result than if you had spent hours reviewing checklists and inspiration boards without a goal in mind. 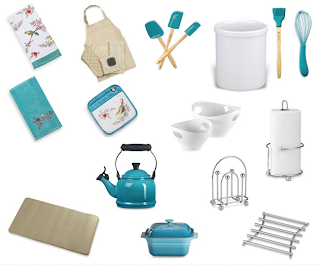 What is the purpose behind your wedding registry? Typically we'll post the newest wedding registry inspiration boards added to the collection. Since they are all new, we'll feature some of our favorites. 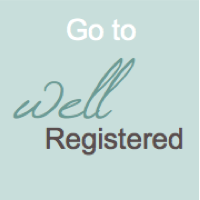 We're so excited to launch Well Registered - the newest resource for wedding registry inspiration and advice. Both the website and this blog have the same goal in mind: to make it easy for you to plan your wedding registry and home. 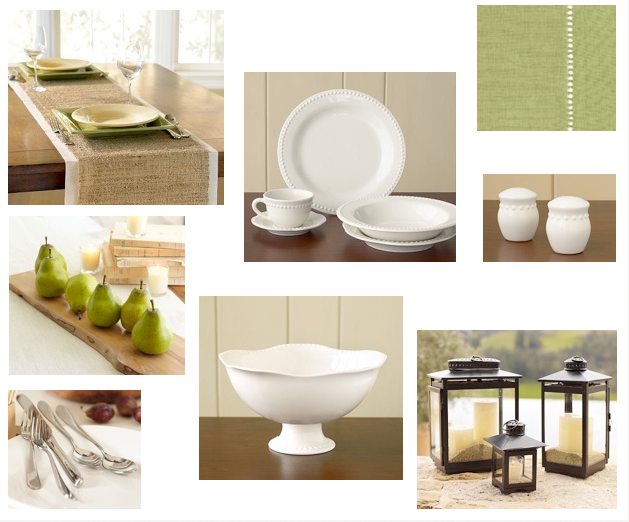 Wedding Registry Inspiration Boards - The inspiration boards are designed around in-stock products that are from a single leading registry store. 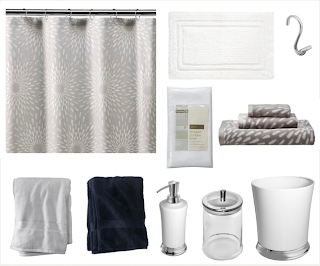 They are designed to help you find what style you want for your home, what stores are right for your registry, and some products that you will love. We'll update the blog with recently added boards and information about new stores we plan on featuring. Wedding Registry Tips + Advice - The Tips + Advice section offers answers to common questions about wedding registries and other general advice. We'll update the blog with the newest articles and also answer reader-submitted questions. 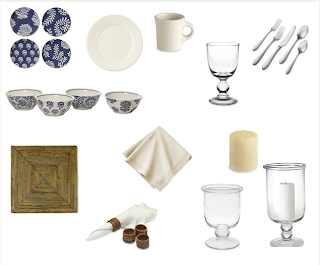 Wedding Registry Checklist - We also offer a very detailed checklist for your wedding registry. We plan to add more specific checklists depending on different needs, so follow the blog to see when those are added. 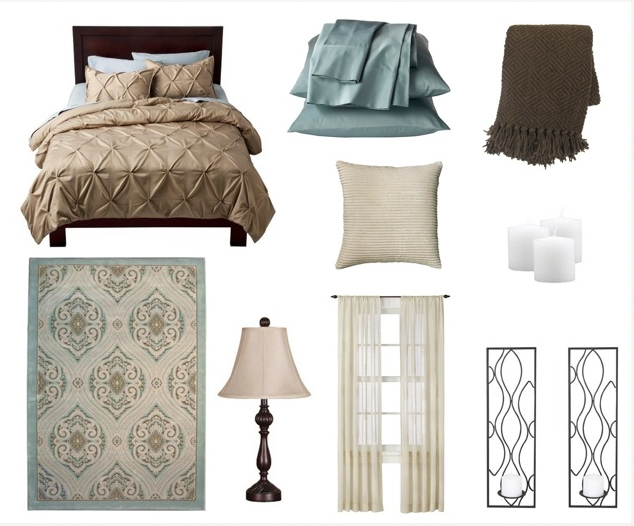 Featured Products - Each week we'll pick some of our favorite products and feature several different room inspirations designed around them. Registry Stories - We hope to interview married couples to get information about their favorite registry items, mistakes they may have made, and any advice they may have for you. Thank You's - Your honest gratitude for the wedding gifts you receive is one of the most important aspects of being well registered. 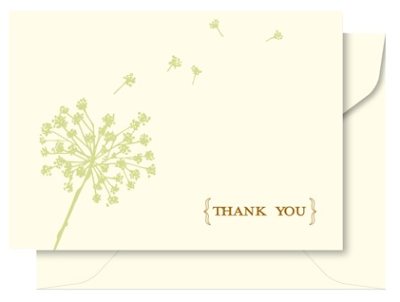 We are going to feature our favorite stationary for saying "thank you," advice about writing the cards, and more. 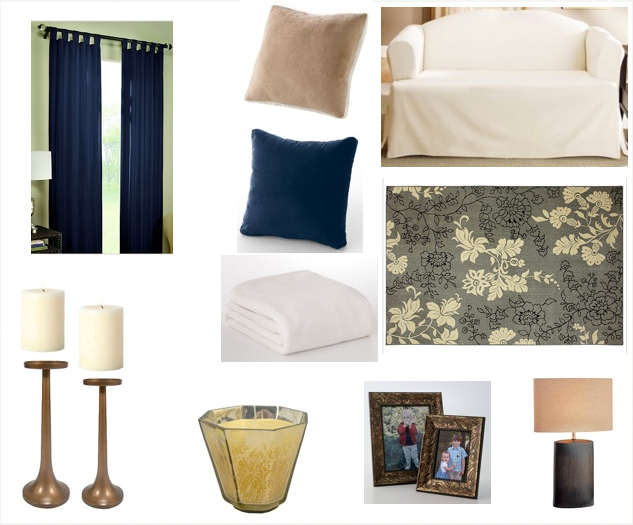 Let us know if there is anything you would like to see on the blog!